He wrought the earth, the heavens, and the sea; the moon also at her full and the untiring sun, with all the signs that glorify the face of heaven- the Pleiades, the Hyads, huge Orion, and the Bear, which men also call the Wain and which turns round ever in one place, facing. Orion, and alone never dips into the stream of Oceanus. Anyone who has been star gazing for any length of time has noticed Orion. Orion is a wonderfully distinctive arrangement of stars that brighten the night sky from December to April. 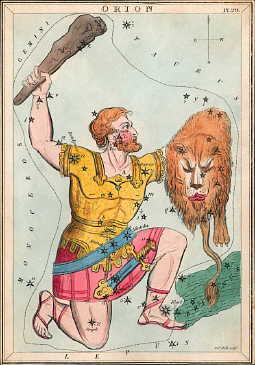 In Greek Mythology, Orion was a giant and a great hunter. It is easy to see the figure of a hunter, complete with lion's skin in his left hand and raised club in his right. In Orion's shoulder is Betelgeuse (BET el jooze or sometimes called BEETLE juice), one of the rare supergiants and is close to 600 million miles across (1,000 million km). It is a superb red color and contrasts with Rigel, the blue star in Orion's foot. Rigel is a blue supergiant. Barely one-tenth the size of Betelgeuse, it is still almost 100 times the size of our Sun. The Great Nebula (M 42), also called the Orion Nebula, is a wonderful star nursery that is visible to the naked eye under a dark sky. The swirls of nebulosity spread out from its core of the four stars called the Trapezium, which power the nebula. The Latin word for cloud, nebula, is the term used for the cosmic gas and dust that lie among the stars. Most nebulae are lit up by light from stars within them. The biggest nebulae do not shine at all. They can be only seen when they block the light of more distant stars. The Horsehead Nebula (IC 434) also know as Barnard 33 is a dark nebula that is projected against a background of diffuse nebulosity, along side the bright belt star Zeta Orionis. It can be quite difficult to see, usually requiring a dark sky and at least an 8 inch (200mm) telescope. Search online for images of the horsehead nebula. For non-commercial use: Click on the images to see full size. Right-click to download.